He is brought into ED by friends in a car as they thought it would be quicker than an ambulance. The triage nurse has noted that his lower leg is very swollen and deformed. He is screaming in pain when he is moved onto a trolley. Q1. What is your initial management for this patient? Q2. Describe the abnormalities on the x-rays. Q3. How would you manage this injury? The patient has a plaster applied and sent for repeat x-rays. Whilst waiting for the X-rays to be reviewed he seems to be in increasing pain despite having had another dose of morphine 10 mg iv. He is sucking on the entonox and states that the pain is around the shin and calf. Q4. What the possible complications of this injury? Q5. 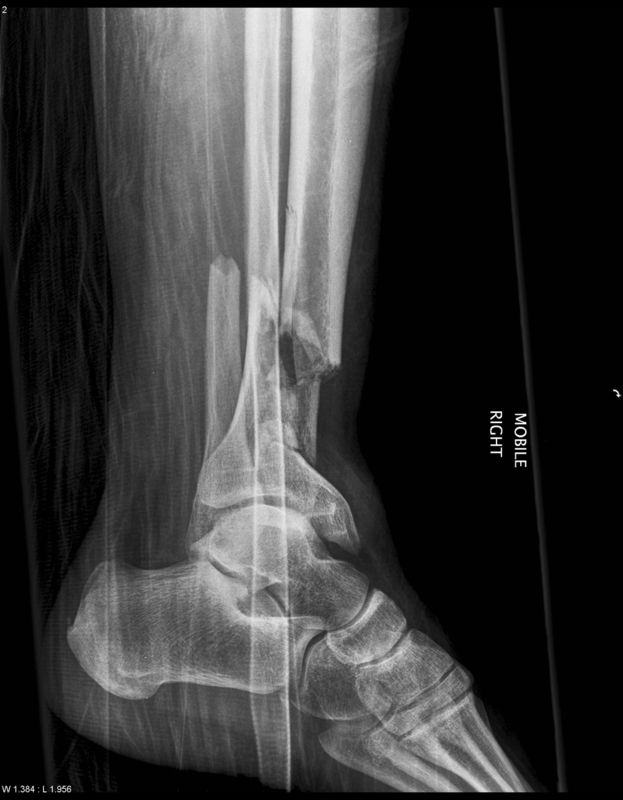 How would you diagnose compartment syndrome in this patient? Q6. What are the different compartments in the lower leg and which are causing the pain in this patient? Q7. What are the other causes of compartment syndrome? Answer one question before attending the face-to-face teaching session. Add comments to answers already given if you think it's appropriate. The first part of teaching will be spent discussing this case.